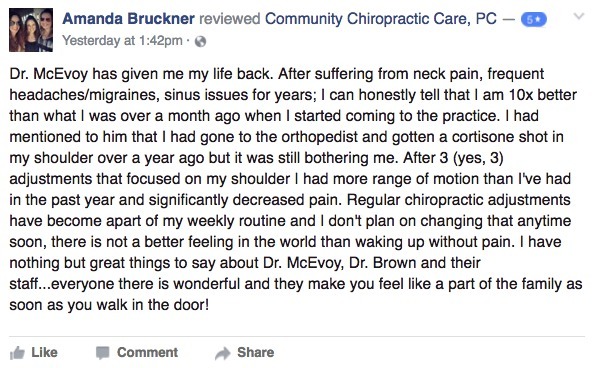 At Community Chiropractic Care we love when patients share with us their feedback and comments after chiropractic care. Please read our patient reviews to see what our patients have achieved through their tailored treatment plans with us. Share your stories too! Click here to send us your feedback so that we can help to spread the word about the benefits of natural care. For more information or to schedule an appointment call or email us today. I was referred to you back in December of 2013 and as you could imagine I was very reluctant and skeptical to go down this path again. There were several people in the area that highly recommended you so I figured I had nothing to lose. You personally gave me a very detailed initial consult which put me at ease and I felt assured that you were very skilled, caring and knowledgeable. My treatments are very targeted to my diagnosis and pain and the visits are very pleasurable and efficient. Long story short, my current pain threshold is 0-1 since January of 2014! That’s down from a 4-5 chronic pain level which I lived with for over decade! All the things that used to cause me discomfort and at times tremendous pain are all now not only tolerable but an afterthought, (i.e.) skiing, ice skating, weightlifting, yard work and most of all rolling around and playing with my 2 young daughters. Thank you Dr. McEvoy and your staff in returning me to a pain free quality of life! Best Regards, James D.
Amazing team, welcoming, helpful and caring… Doctors really care how you feel and do. I will complete my treatment here and will highly recommend it everyone! Love the attitude of Doctor McEvoy. The whole is professional, polite, and helpful. Good job Doc. My first experience with Dr. McEvoy and his staff was superb; I felt very comfortable and heard. I look forward to continuing my experience with them. They are so nice and kind over there. Smiles start as soon you open the door. Very nice staff, clean office, Dr. McEvoy was straight forward about my injury and what needed to be done to correct it. Overall great experience. I was a little skeptical when I first walked in because of how open the facility is, but every staff member is so wonderful that I felt comfortable right away. I am extremely happy I found this place & Dr. McEvoy is fantastic. Dr McEvoy is very professional, pleasant and thorough. He clearly explained everything to me after viewing my xrays in a way that was easy to understand. I’m confident in his expertise! Jennifer H.
Love the service and technology. Noel P.
Happy that I found this Place. Rob and his staff are awesome and so helpful. Vincent S.
The doctor was very knowledgeable and thorough. The entire staff was efficient and provided phenomenal customer service which will always make me a customer for life. Jaclyn C.
Very professional and the staff are great! The chiropractic adjustment are done perfectly. Nice clean comfortable office. I recommend highly. James B.
I am so grateful to have found Dr. McEvoy and Community Chiropractic. I truly felt comfortable and confident in my care. He listened to my current pains and my current plan has improved my mobility tremendously. Dr. McEvoy has made this process easy and effortless, leaving me with no worries or fears. Melissa R.
Dr. McEvoy is a great chiropractor and I would recommend him to all of my friends. He really listens and tries to help you as much as he can. I had mid back pain and with his help, it is practically gone! Not only is he a great chiropractor, but also he is a genuinely good person and very confident with his chiropractic skills. Christian A.
I love everything about Community Chiropractic Care. Very friendly staff and a pleasant environment. I am in and out in no time. Audrey M.
Feel confident that the specific protocols chosen by my doctor will help me feel better and function well in my daily activities. Feel comfortable…caring environment..not rushed as in other practices I had experienced. Thanks so much! Bruce E.
You exceeded my expectations, Keep it up! Surinder A. Thank you for your patience. The heat treatment was excellent and made me feel very good. It helped a lot. Hope I will be able to stand on my own next time. Everand B. Loved the place, people & my practitioner. Would definitely recommend this location to others without a doubt. Tausif R.
I was welcomed in without an appointment they took me right away because I was in pain. I felt better with in a couple of days considering I was in pain 5 days before I walked in. I thank them with all my heart for the service they gave me. Nicholas D.
I am very pleased with the level of care and service I have received at your practice. I am very confident that I will get better! Regine D.
Everyone in the office is amazing, as soon as you walk in the door you’re welcomed, I’ve only been there a few times and everyone knows my name and I know theirs, they’re just amazing. I recommend everyone to go there! Amanda P.
I was very happy with the staff and the service I received. I will recommend this office to everyone that needs help with their back. Sean H.
Best Chiropractor I have ever seen! Explains everything very thoroughly. By the time I walk out I feel like a new person! Catherine L.
I have had an excellent experience so far and the staff is welcoming and friendly and they really know their stuff. I have the utmost confidence in all of them. Jennifer K.
At my first visit I knew I made the right choice to come to this office. Not only did Dr. Robert McEvoy make me feel amazing and treat me with respect, I felt like the staff knew me for years. I would highly recommend family and friends to this office without any questions asked. God Bless everyone at this office. Edwin A. My lower back has never been better. Dr. McEvoy and Dr. Brown are very thorough and have gone beyond just treating my lower back pain. They have addresses by fibromyalgia symptoms to a point that I have not had to take as much Tylenol or muscle relaxants. I have seen a very big improvement in my fibromyalgia symptoms. The office work flow is extraordinary, little wait time, highly organized in a pristine environment. The staff treats people like family. Best chiropractors ever. I’ve been to many chiropractors, they are by far the best! Joseph N.
As always, I felt very cared for. Despite seeing many patients daily, I always feel that Dr. Brown has been waiting just to see me. My therapy and treatments have helped me live more normally and experience less pain. Josephine G.
Professional, courteous, and cared about my condition. Alphonso C.
Dr. McEvoy’s office is very organized and clean. Whenever I walk in I am greeted by name and with a big smile. The office staff is so welcoming. Dr. McEvoy is professional, but he also has a great sense of humor. I would highly recommend Dr. McEvoy and his wonderful staff for any chiropractic needs. Deborah B.
Couldn’t ask for more! Clean office atmosphere and staff is very pleasant. Margaret N.
Since my accident, I’ve been coming to the chiropractic office. Since that time my back pain from the accident has improved. The doctors at the chiropractic office are professional, warm and caring. I would highly recommend this chiropractic office. John P.
Every visit with Dr. Brown is a positive experience. She takes the time to assess your condition and tailors treatment accordingly. After several visits I am back to all athletic activities with no pain, which I never thought was possible. Dr. Brown is an outstanding chiropractor who cares about her patients. The staff is friendly and professional. The office is clean and pleasant. Brigitte Z.
Dr. Brown made such a huge difference, I was able to swim with more ease, comfort and increased flexibility. It resulted in three personal best times. I love Dr. Brown! Jacqueline Z.
Dr. McEvoy has excellent bedside manor, which is a dying skill in this profession. The staff is courteous, professional and very welcoming. You are never rushed and all concerns are heard and dealt with in a timely fashion. Nikka M.
It was my first visit to a chiropractor and I was very surprised at the professionalism of everyone in the office. My negative thoughts of what a chiropractor was were put to rest. I recommend Dr. McEvoy. Katherine S.
Having worked with Dr. Robert McEvoy in the past for my back, there is no question that I would seek him out again. The staff is amazing! Nicole and Jackie are so pleasant. They greet you with a smile and ask how you are – so personable and professional. Stephanie and Katie do the same and immediately set you up and continuously monitor your treatment. Lastly, Dr. Brown, who introduced herself the first day, greets, inquires about my status and treats me if Dr. McEvoy is occupied with someone else. No words can truly describe the total care that Dr. McEvoy offers. He is skillful, patient, understanding and very professional in all aspects of my treatment. I always leave with a smile and in better condition than when I entered. Diane G.
The doctors and staff are personable and attentive. They relate personally and professionally. Community Chiropractic Care is a health promoting environment with competent, trustworthy medical professionals and staff who make obvious efforts towards their patient’s well being. I have greatly appreciated the experience of working with these fine folks. Dimitrius G.
I have some lower back pain on both sides, along with arthritis. Both doctors have helped tremendously with adjustments to my lower back and neck. Thanks to them I am able to drive my car a longer distance. Joseph V.
Great experience. Doctors explained the treatment they recommended to eliminate my back pain based on my initial evaluation. Dr. McEvoy and Dr. Brown were excellent in reducing my back pain from the first visit. Office staff is very attentive to each patient and office is very clean, appointments are on time and professional. I highly recommend Community Chiropractic Care. Robert B. Both doctors are super and they are right on the money with their diagnosis! Richard G.